On the weekend of June 9th and 10th, the faithful from the community as well as visitors and friends from afar gathered for the blessing of and first Divine Services in the new chapel. This historic occasion was punctuated with the Baptism of Ana Lucia, whom we wish "Many Blessed Years!" We offer up thanks and glorification to God who has brought this all to pass, and we extend our sincere appreciation to everyone who help to make this happen! On April 20, 2019, following the Divine Liturgy of Lazarus Saturday, we had the blessing of a new Holy Shroud to be used during the upcoming Holy Week and Pascha. 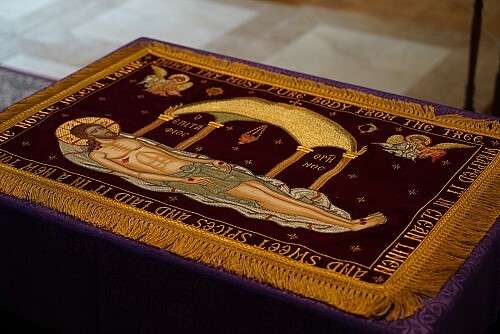 The icon depicts Christ after He has been removed from the Cross, lying supine, as His Body is being prepared for burial. The scene is taken from the Gospel of St. John 19:38-42. The following hymn is embroidered around the edges of the icon: The Noble Joseph, taking down Thy most pure Body from the Tree, wrapped It in clean linen and sweet spices and laid it in a new tomb.